Eating right just got easier: These three new tools can help you stick to your goals. The American Heart Association advises eating no more than 1,500 mg of sodium per day—that's less than a teaspoon of salt. "Spices are a great substitute; they add flavor with minimal sodium," says Sarah Krieger, RD, a dietitian based in St. Petersburg, Florida. 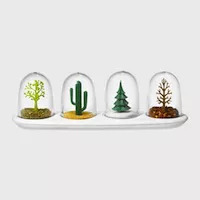 Try this: Replace the salt shaker with a spice set, like this one from the MoMA Store ($39; momastore.org). Nix the sweet stuff by swapping sugary drinks for flavored water or seltzer. "It's the best choice if you want something that's thirst-quenching without added calories," Krieger notes. 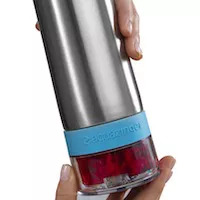 Try this: Put chunks of fruit or veggies in the bottom compartment of the Zing Anything Aqua Zinger ($26; zinganything.com), then twist to chop them into small pieces, releasing loads of flavor into your H2O. "Fresh green herbs like basil, rosemary, and thyme are packed with disease-fighting compounds," Krieger says. Plus, their hit of flavor helps you feel satisfied without overdoing it on high-cal sauces and oils. 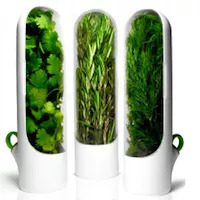 Try this: Prolong the life of delicate greens with the Prepara Herb-Savor Mini Pod ($15 each; prepara.com), which goes in the fridge and keeps herbs from wilting for up to three weeks.